A £500,000 fund has been set up to help the far north economy become less reliant on the Dounreay nuclear plant. The North Highland Regeneration Fund will offer start-up support to new businesses. The Nuclear Decommissioning Authority (NDA) is also to publish details of its socio-economic policy. 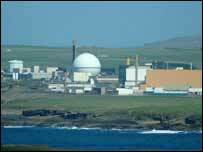 It will set out how the NDA will work with other organisations to ease the impact on the area once Dounreay is fully decommissioned. NDA's chief executive, Dr Ian Roxburgh, said it was crucial that it used the time available to prepare for the nuclear site's eventual closure. He said: "The Dounreay site contributes £200m to the local economy at the moment and will do so for a period. "We have got 20 years and we need to make a start on encouraging and introducing now sustainable jobs to replace those that will vanish along with the Dounreay nuclear complex." The UK Atomic Energy Authority, which runs the plant, expects decomissioning work to be completed in 2036. The 140-acre Dounreay site is being cleaned up at a cost of £2.9bn.